This last week, I spent time working on one of the focus points I brought up last week: resource deployment using U/R Gifts Storm and Affinity as my tools. Why did I focus on these decks? U/R Gifts Storm and Affinity are hard both on a point-by-point tactics level and a broad strategic one. The second one is the interesting part to me. I've been doing the count-to-a-number stuff for a really long time, usually ending in Tendrils of Agony. The big reason these decks are playable is that when your pieces come together you are doing something really busted, often spearheaded by one or two huge payoff cards. 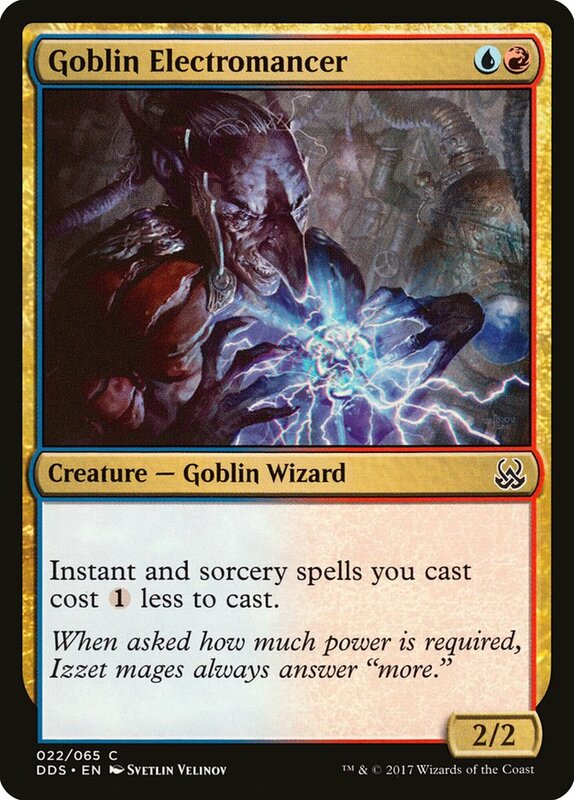 U/R Gifts Storm and Affinity aren't quite as fast as you can get in Modern, but your opponent should be reliably dead by turn 3 or 4 in a way that isn't a total bust if you miss. See Goryo's Vengeance or Puresteel Paladin for those kinds of all-in games. This leads to another property of these decks: there's a basic threshold of competency where you win enough with them due to the easy mode games, but you can really get crazy and win more given a lot more effort. The classic 50% of the work gets you 80% of the way there. No matter how easy it is to equip a Cranial Plating on turn 2 and win if unstopped, I still believe Affinity is the most complicated major deck in Modern. Or maybe second, but based on my win rates with Dredge I know negative information about playing that deck optimally and can't judge it at all. That makes it both great and horrible to try to learn this stuff. There's a natural learning curve that eases you into the really complicated stuff, but at the end if you're actually trying to learn, it's sometimes oddly frustrating to just nut draw opponents. Lesson One: When there's a doubt, figure out what your ideal finish is and work backwards. The first lesson of Storm is that your kill shots are pretty hard to interact with if they go off. Unless you are going for all of it, you should have a clear idea of what your stopping points are. The difference between twelve and sixteen Goblins isn't relevant if they can't block, which could save you a couple spells. This usually comes up in short Grapeshot scenarios. You have a Grapeshot in hand and some nonsense involving Manamorphose and Rituals. Often this is a spot where if one of the top couple of cards of your deck is another Ritual effect you get to actually kill your opponent, or a couple specific chained spells lets you Grapeshot + Remand kill. Or my personal favorite: you just need a land to kill them. This is a pretty normal situation, where you either ran out a first Baral, Chief of Compliance only for it to get Path to Exile'd or just one where you didn't want to cast your important cost reducer until your opponent made an opening. Playing Baral leaves you with one untapped mana, then Pyretic Ritual (plus two) into Manamorphose (plus one) into Manamorphose (plus one) adds up to five. Gifts Ungiven into Past in Flames into a million things takes six mana with cost reducer: three for Gifts Ungiven, finding Pyretic Ritual, Desperate Ritual, Manamorphose, Past in Flames, at minimum you get Past in Flames plus Manamorphose, which adds another mana, then you use three to cast Past in Flames and still have a leftover mana. 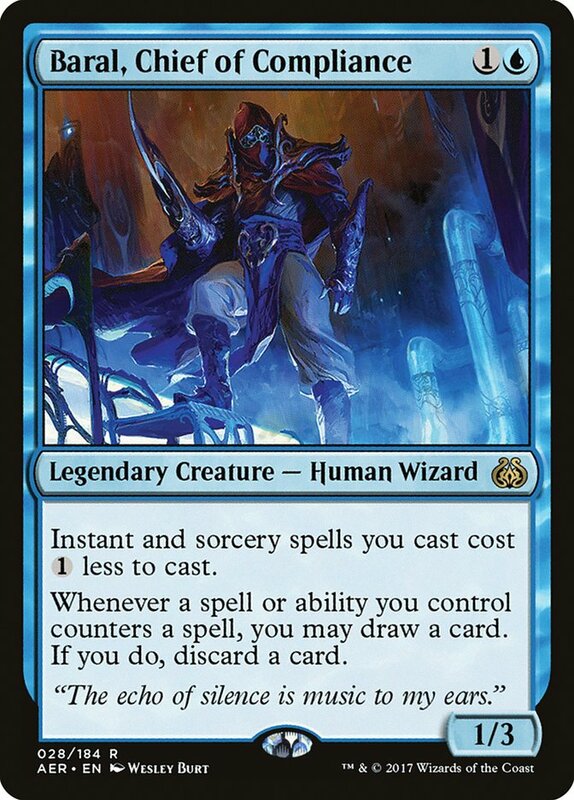 The autopilot play would be to lead on Pyretic Ritual, then cast the Manamorphoses to maximize your blue mana for cantrip chains. The problem is that casting more than one cantrip in a lethal chain here is unlikely, and even the first cantrip forces you to find another Ritual instead of just a land to hit Gifts Ungiven lethal. You're leading on the first Manamorphose here, but if that just draws another Gifts Ungiven or cost reducer, what's your plan? How much do I need to Grapeshot for if they don't die? If the answer is nothing, I'm just going to fire off the second Manamorphose and settle for a setup Gifts Ungiven and a kill next turn. The Pyretic Ritual is likely an important piece of that, especially if they kill my Baral and I have to run through these same creature-into-spells motions again. If a Grapeshot for actual amounts would swing the game in my favor, then I can fire off the Pyretic Ritual at the end of the chain. My likely closeout is Gifts Ungiven into Grapeshot, and that leaves me using four of the five mana I expect to access. I don't need to optimize for maximum blue mana if I just have one left to spend. To summarize, this is a bit of an inversion of typical Storm mana optimization. Instead of the goal always being "How do I cast the most things off this mana?" there are uncertain scenarios where you need to think about "What happens if I miss, what is the best way to audible into a productive turn, and how much do I need to extend to make sure I can hit?" With Empty the Warrens, this is just basic math. They have a certain number of blockers, I lose a Goblin per block, they can in theory play this many other blockers or kill spells, how many attacks do I kill them in? 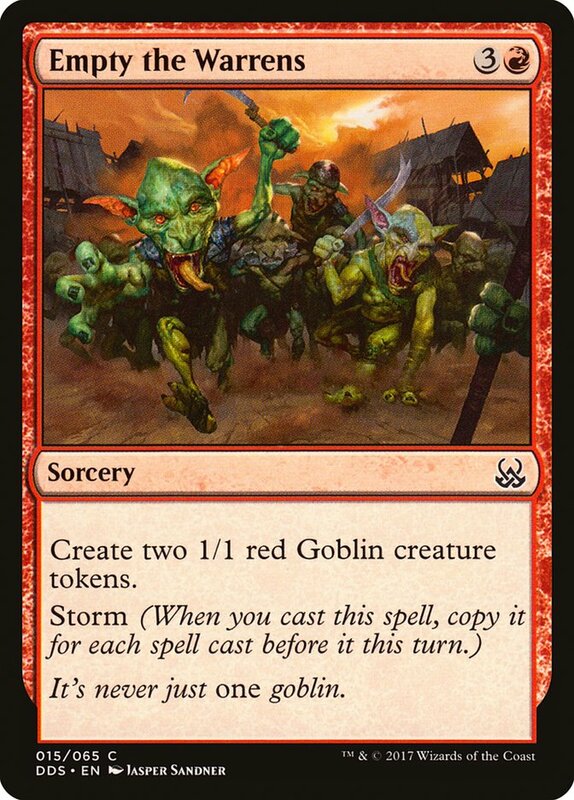 A simple example: An opponent at seventeen life with a blocker dies in two attacks to ten Goblin tokens (single block and nine get through, then eight the next turn), but twelve Goblins would play around a removal spell or an extra blocker. Fourteen Goblins starts getting into the play around multiple things territory, and sixteen only matters if you think a second attack might not happen and you want the shortest Grapeshot possible to kill them. This math is pretty unique to each life total and battlefield, so there isn't really a shortcut besides "Do math better and don't mess it up." I haven't had to relearn math lately, so I don't have any deeper sage wisdom beyond you know, doing math better and not messing it up. Lesson Two: Maximizing value sometimes doesn't play around anything. There's a similar dance involved with playing around removal on your cost reduction creatures. 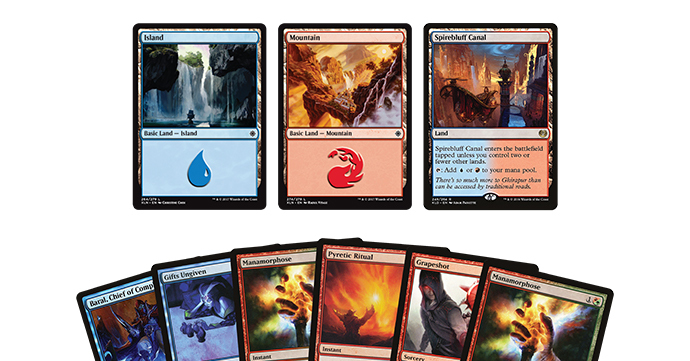 You can set up spots with four lands where even if they Fatal Push your creature, you can re-Ritual in response, cast other instants, and get a lot of mana out of that. As cool as that is, what's the point of it? This Storm deck is really bad at making mana without a cost reducer. You only have four Pyretic Ritual, four Desperate Ritual, and the only way you're getting more than one mana per card involves multiple Desperate Rituals and a lot of mana to start. Ever since Seething Song was banned years ago, the Modern Storm deck has always been more about resolving some two-drop enabler than hand selection and Ritual stacking like its older counterparts. What that ends up meaning is that unless you can make a ton of mana via this first chain, you probably can't actually make a lethal Grapeshot happen. You don't have mana to re-Gifts off your Past in Flames, or even enough to just cast your nonsense cantrips to get to Grapeshot plus Remand range if you have that. This often means you should be playing with less fear. If your opponent isn't giving you a tap out opening and setting up this fancy play doesn't actually beat the thing you are trying to maximize value against, don't set it up and just jam. If they have it, they have it. A lot of the finesse in playing these decks is realizing you don't have perfect information and you can't win them all. You just try to win more and more of them over time. For someone whose usual plan is casting Thoughtseize, that's just weird. Or in this case your cantrips should have been doing different things since turn 1. But how to cantrip was the article I wrote last month , so I'll stop here. Lesson Three: Determine a minimum game winning unit. Affinity is a bit different than Storm in that the process is a little more arbitrary. 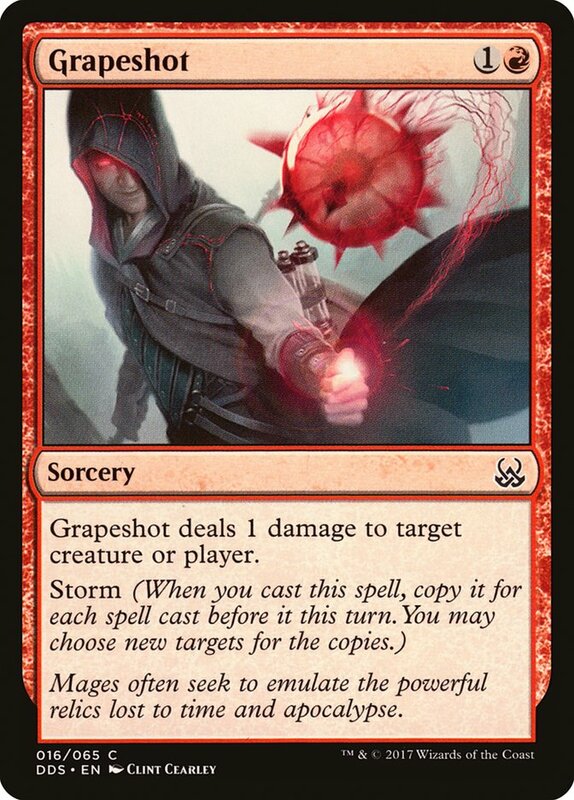 Storm almost always narrows the actual end game down to Grapeshot twice, cast Gifts Ungiven for Past in Flames, or Empty the Warrens. Affinity has lots of weird attacking combinations to consider that add up to twenty damage or ten poison counters. When you're worried about overextending, the first thing should be figuring out the least you need to do to win a game. 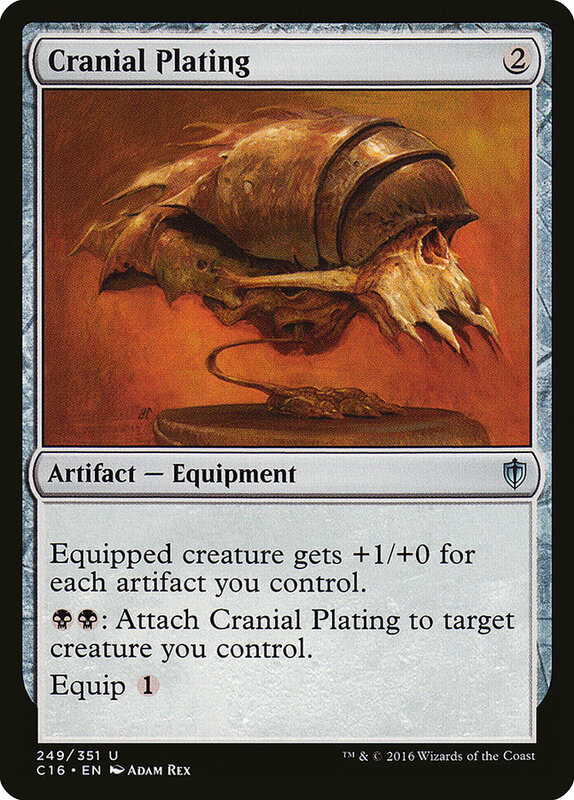 In Modern, that is basically nothing if you drew Cranial Plating, some stuff if you have Steel Overseer or Master of Etherium, and a whole lot with Arcbound Ravager. 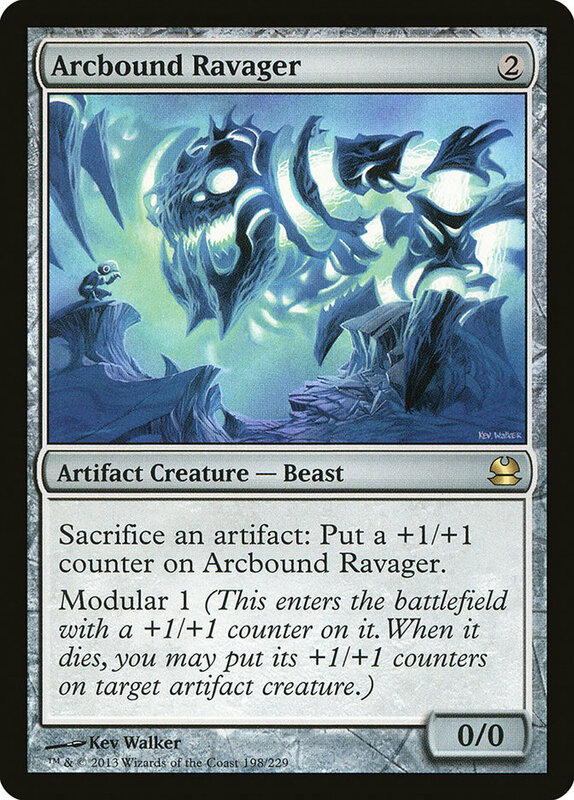 Okay, that might be misrepresenting Arcbound Ravager, as often the question is what you need to commit a couple turns before artifact Fireballing them. This is a context-required situation. What is the limiting factor? Are you crunched on time in addition to being wary of losing everything, such as against U/R Gifts Storm? Your minimum game-winning unit might need to be larger in order to kill faster, and then you just accept the risk that if you get Grapeshotted your next kill will be slow and you hope theirs is too. See Andrew Elenbogen's win-and-in at SCG Cincinnati a few months ago. You see this issue a lot in Standard, where your aggro deck doesn't want to run into whatever random sweeper exists, but at the same time if you don't do enough, whatever giant lifelink or battlefield-clogging threat that exists at five or six mana kills you. Or in this Standard format with Ramunap Red where if you leave up Abrade for their Whirler Virtuoso to cut off a Thopter token they might just kill something then play Bristling Hydra. If you aren't ahead enough to beat Bristling Hydra, you may as well just jam and hope their turn 3 is Rogue Refiner. If you have a bit more time, you can get into classic pacing. 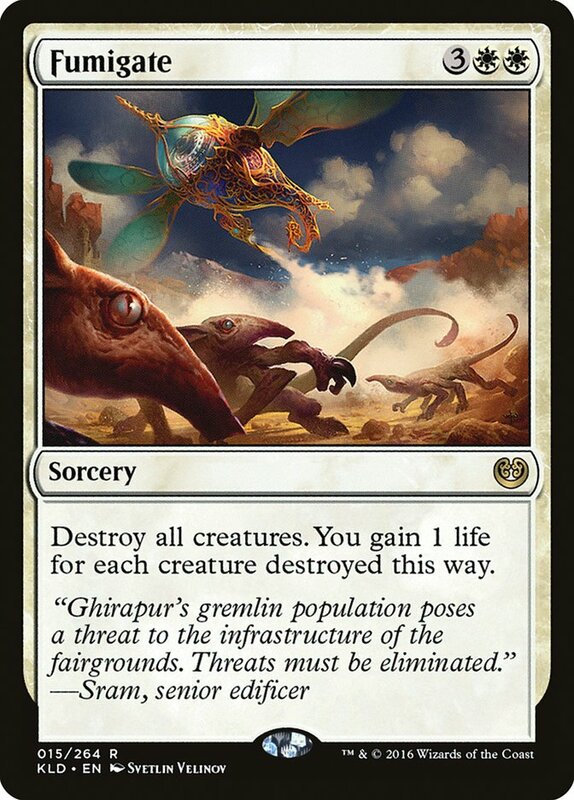 Stick to playing two creatures so you can use the double black ability of Cranial Plating in response to spot removal, especially if one of those dorks is an Ornithopter. 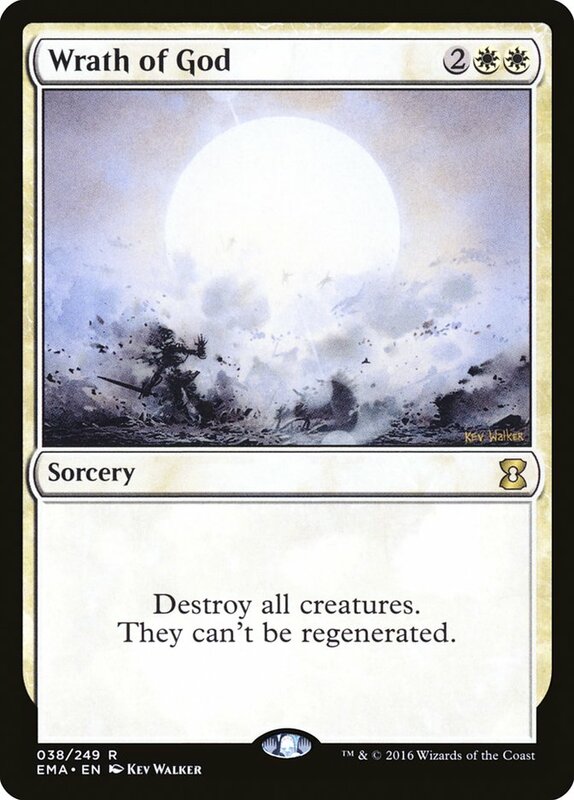 The only concern then becomes not letting them upgrade cards like Electrolyze into sweepers by keeping your pairs from being multiple one-toughness creatures. Use your resilient cards to maximum effect. Only use your Nexuses when they can't answer them or when forcing them to answer on your turn is profitable. Affinity isn't great in these standoffs, but it can try a lot of tricks before giving up. Use forced sweepers as opportunities to land Cranial Platings or Etched Champions. Talking about Humans against Jeskai with a friend, the same thing came up. The tribal aggro decks operate in this building a whole out of average cards space, but their random threats have two power and can end a game. The current Jeskai lists don't have a real game-closer. You have infinite time and can only really get buried if you let them do it with Supreme Verdict. There's no reason to play a Meddling Mage and a Thalia, Guardian of Thraben at the same time unless you are just coming out of the gates hard and think they are just going to die before doing anything. The specific scenario this came up in involved Cranial Plating, Inkmoth Nexus, and the old half-and-half. 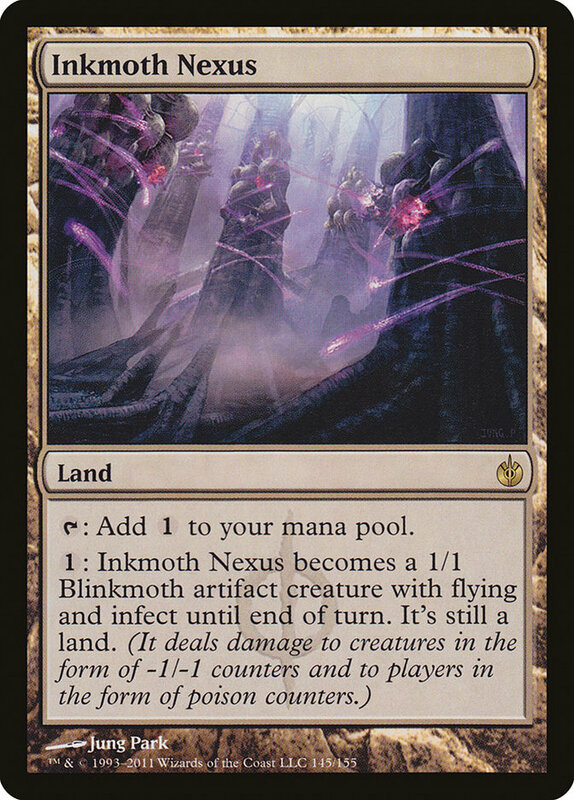 I had my opponent at just above ten life before their first sweeper, but then got to crack back with an Inkmoth Nexus hit for five infect. The next turn, instead of going for the kill, I elected to try for half their remaining life with my Ornithopter. 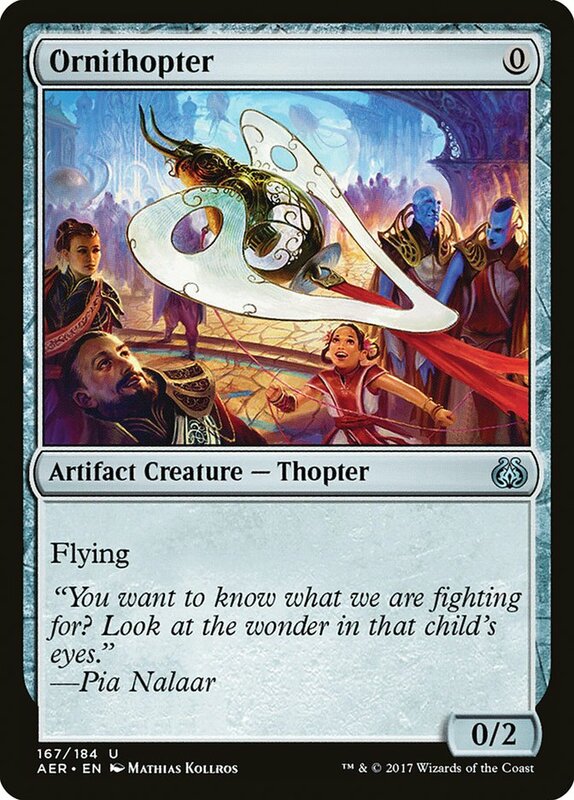 If Ornithopter died, I could just replace it with another threat. If it didn't, they would immediately have to answer everything in a way that didn't let me instant speed swap my Cranial Plating to my other lethal threat, which ended up an impossible task for them. With Storm, this can also be a useful tactic. Make just enough Goblin tokens to be threatening, then use them tapping out for a sweeper as an opening to really combo. 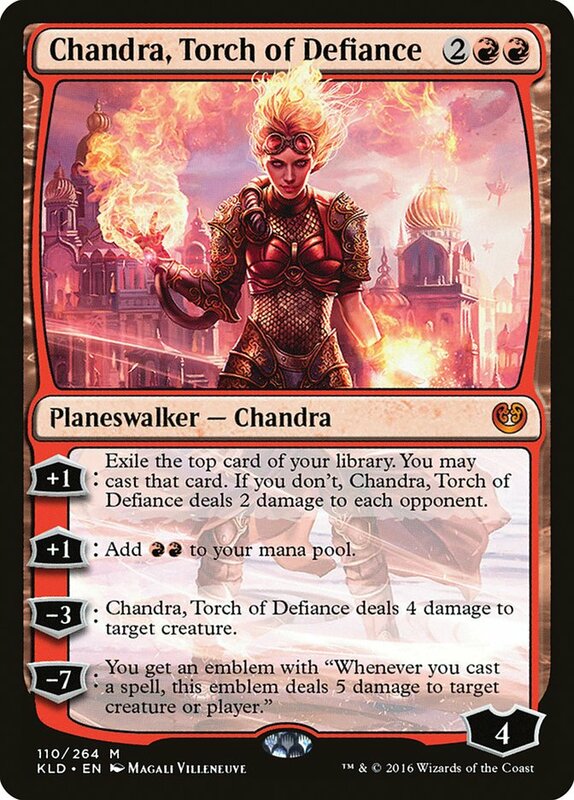 Or in Standard, where you can bait a Fumigate with your random red dorks only to slam a hard-to-answer Chandra, Torch of Defiance. Despite both shells being largely linear, there's value to another angle. Make sure it fits the big picture plan of your deck so you don't just draw blanks when your deck is trying to have good draws. Make sure you actually have a plan to reliably resolve it in a spot that matters. Make sure it is actually resilient or threatening enough to do what it is supposed to. Then win games with it. After this testing, I don't think this lesson is actually that crucial for Modern. The kill conditions of flying dorks or Grapeshot are hard enough to stop that the thread-the-needle situations are fairly easy to figure out. Once February rolls around, I might re-explore running whatever dorky creatures are good into Whirler Virtuosos as a step up to hard mode, but for now I'm shelving this goal. My next focus is going to be figuring out how to vet sideboard plans on minimal testing in Modern. My last sideboard notes sheet for a Modern event covered 35 matchups. You can't reasonably test all of them, and it isn't even worth the time to do so. When you start overlapping your sideboard slots, the danger is that you start getting into spots where you sideboard into the right number of cards, but not the right number of individual effects. I have some ideas on how to start this that involve a lot of lists, which in turn means there's definitely good work to do. I'm unsure if I'll have it tried for my next Modern excursion, but I'll certainly try. *It was actually 34 and a I'm going to lose to Dredge, but close enough.